What should we name our new pet? 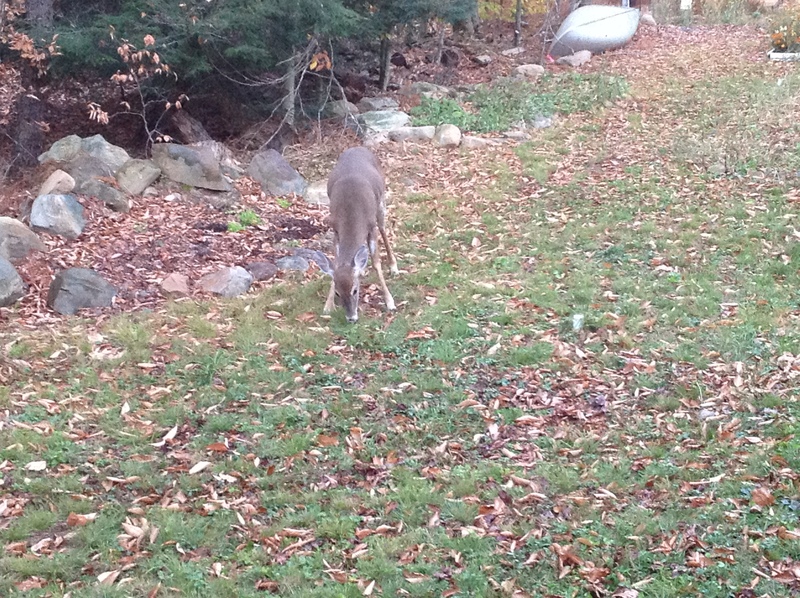 The flowers are gone – many succumbed to the heavy frost that we experienced this past week, but more than a few ended up being dinner for this lonely deer who has visited with some regularity the past few days. By all rights, we should be angry with this guy, but we just can’t seem to adopt that point of view. 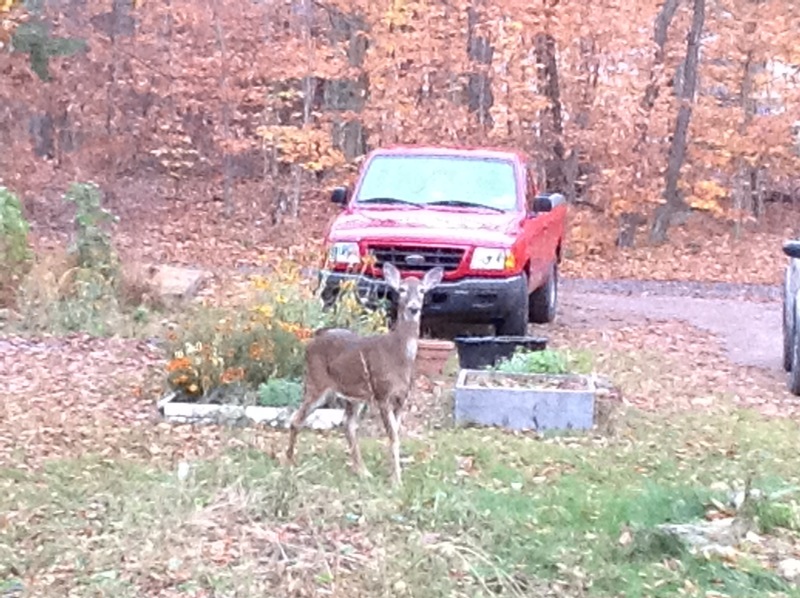 Perhaps, after living in town for 13 years, the country experience, including bear and deer in the yard is still just too exciting. We already made the decision to focus on flowers rather than vegetables – due to a combination of limited sunlight and the ever present population of deer, rabbits etc. But it is still somewhat disappointing to arrive home to find that all that remained of the sunflower which had reached a height of 3 feet was a bare stalk measuring no more than 12 inches…. So we considered our options.. yell at it, throw something at it, ( not allowed to shoot it ) , chase it away, feed it an apple…. well, I am reminded of those tests that we took in school long ago – look at the four pictures and decide which one does not belong.. – hmm what is he eating now? Our new friend looks absolutely delighted.. No doubt, we will be kicking ourselves next summer if he reappears to munch on our flowers.. but look how content he is! How could a birthday weekend be complete without a cake? When we got home from the shore we decided that a cake was definitely in order… so what kind to make? One of my favorites is a chocolate mayonaise cake with cream cheese frosting that I have been making since I was a kid, but a close second is a three layer 4-egg yellow cake taken from the Joy of Cooking cook book, topped with chocolate frosting found on the Hershery’s cocoa container… the yellow cake won, and we decided it would be a group effort. 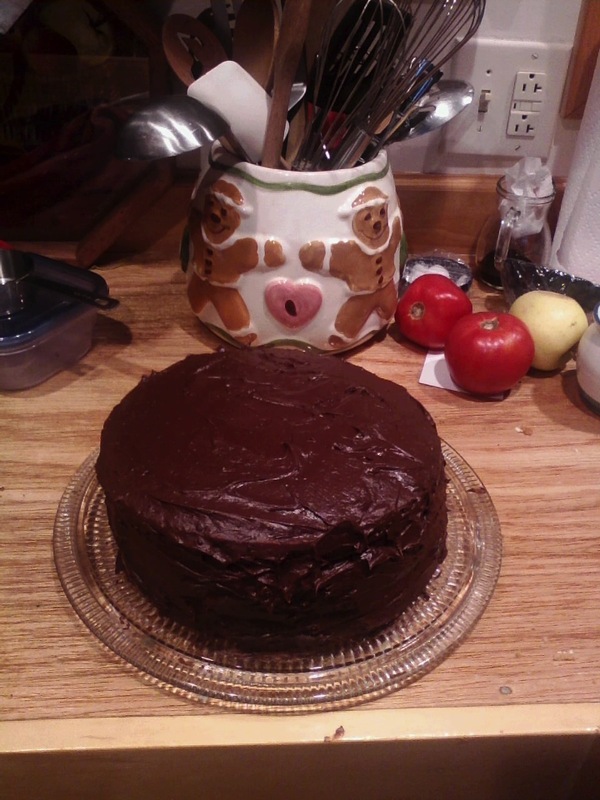 I made the cake, and Janet made the frosting.. we invited our neighbors over to share the cake with us. Rhonda made it, and we sent a piece home with her for Pete. The secret ingredient in the cake is really not all that secret at all since it is suggested in the recipe .. substitute a half teaspoon of almond extract in place of part of the vanilla.. yum! A long weekend in October that just happened to coincide with my birthday – wonderful timing for a trip to the ocean! Earlier in the week I got the bill from the Marina for hauling the boat so it appeared that an added benefit would include being able to cover the boat with the help of my wife… what more could a guy ask for?? We arrived at Ocean Grove a little after 8 pm on Friday evening. After checking in to our Bed and Breakfast, we walked to the beach. It was rather windy, and apparent, even in the dark, that the surf was rough. We enjoyed a stroll on the sand up to the north end and then ventured a little way into Asbury Park. It was pretty quiet except for one venue in Asbury Park that appeared to be a hang-out spot for the younger crowd. Back to the B&B for a cup of tea and some reading before turning in for the evening. Early in the afternoon, we decided to make the 40 min trip to the boat to complete the task of covering it so that we could get back to Ocean Grove in time for an early dinner. Upon arriving at the marina, it soon became apparent that I had made the erroneous assumption that getting the bill for hauling the boat meant that the boat was, indeed, on land. Nope- there she sat in her slip 😦 We made the best of the situation, removing the sails, the engine, and other items for storage at home. It looks like one more trip to Jersey this fall! By the time we returned to Ocean Grove, the festival was winding down.. no more butternut squash soup – bummer, but we enjoyed pizza and then bought an ice cream cone at Nagle’s, along with a cup of tea and headed to the boardwalk. The wind had increased, and the ocean was really whipped up. Later I found that it was blowing 25-30. 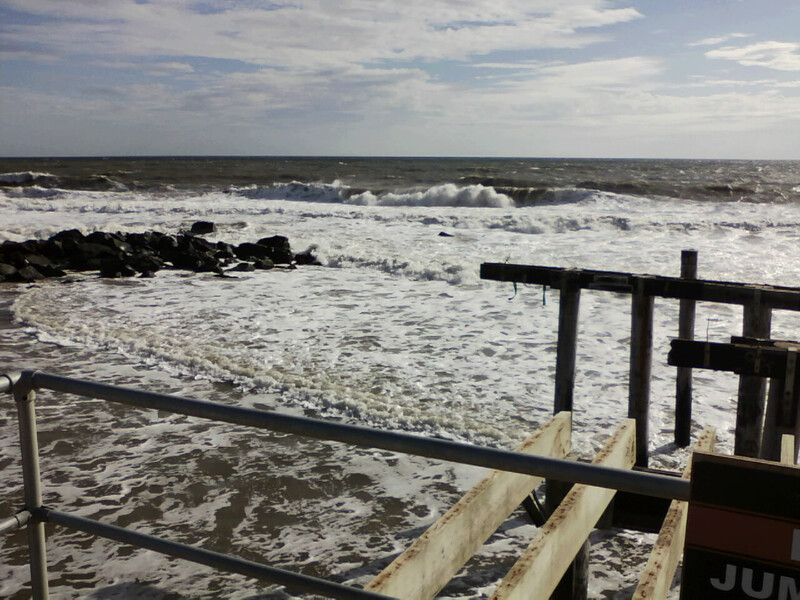 The picture above was taken at what used to be the fishing pier prior to Hurricane Sandy last fall. There were no boats on the ocean, and even the surfers seemed to have the good sense to stay out of the water. We lasted about 10 minutes on the boardwalk before surrendering and returning to the B and B where we sat and read in the living room. We greeted a number of couples who came in, but one couple, Bonnie and Mike, stuck around and chatted for a while before we all called it an early evening. We enjoyed breakfast with Bonnie and Mike this morning and then continued our conversation on the front porch – invited them to attend the Apple Festival at the orchard next weekend. 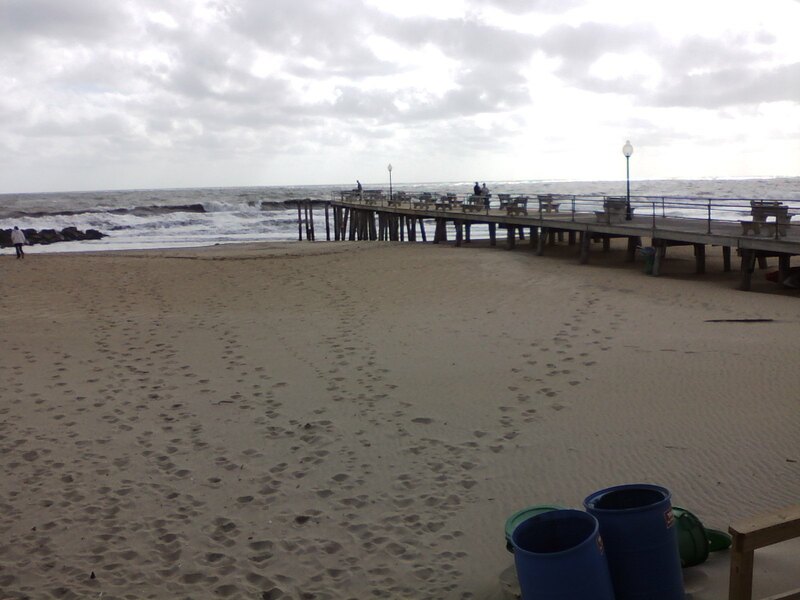 The wind was still steady and strong this morning – bad news for the couple that was planning on being married on the beach later in the day. A visit to the bakery – a sweet and another cup of tea to take with us on one last trip to the boardwalk… it turned out that it was still too windy to really enjoy sitting there. So we decided to walk in town, along side streets where we could enjoy the Victorian architecture for which the town is known. Before heading home, we opted to have lunch at Starving Artists at Day’s.. this happened to be a spot that I took Janet to on our first real date years ago.. We were fortunate to be able to sit outside this afternoon – what a nice way to bring the weekend to a close.. except, there is more.. but we will address that in the next entry! It seems as though I am always baking in preparation for a trip to the boat 🙂 In fact, these won’t be around that long. Tomorrow afternoon we head out to NJ to cover the boat which has already been pulled for the season. It is a sad time, particularly since we did not spend as much time on the water as we had hoped to this year. But, it will be a fun trip, a mini get away – who can complain about that! Periodically, I get a craving for apple dumplings, but never quite as often or as strong as in the fall, of course. I usually like Macs.. I like they way that they cook up and get soft. But this time there are Macouns ( a macintosh – jersey black cross developed in NY in the 1930’s) hiding behind that wonderful crust. In my younger days, one of them would have already disappeared, but the mature, self-disciplined older guy that I am will wait for my wife to come home so that we can share the tastes of fall together. I enjoy mine warmed in the micro wave with milk poured over it. I rarely eat one without being flooded by memories of ordering them for desert at Meyer’s Restaurant in Quakertown PA back in the 70’s. Meyer’s is no longer there, and that is a shame. My folks and I enjoyed many fine meals and great family time there. 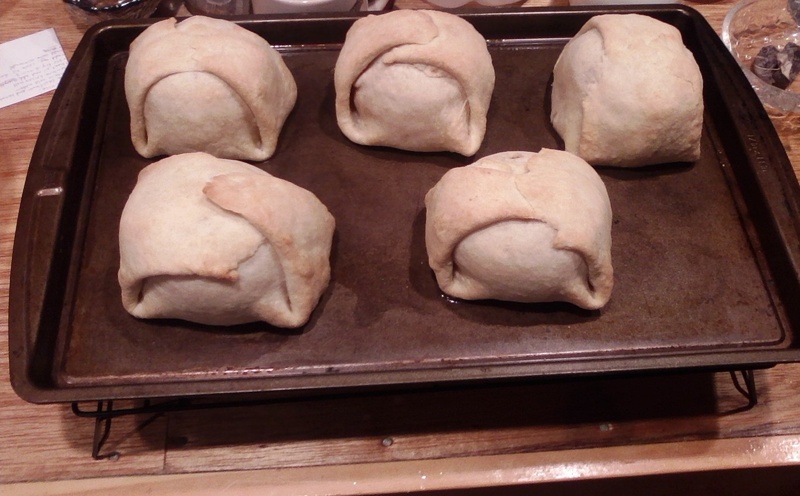 Perhaps the nostalgia is stemming from the Pandora channel that I happen to be listening to this afternoon.. lots of Carpenters, Bread, Carly Simon, America.. what great music.. baking apple dumplings make the house smell great….she better get home soon!